Running Blade Manufacturing is a Manufacturing Industrial Outbuilding that grows on Medium and High density Industrial Zones. 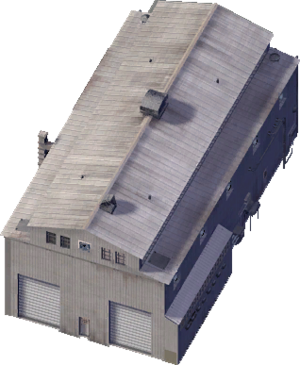 Outbuildings are grown by SimCity 4's Industrial Zones attached to an Anchor Lot, designed to fill out the entire zone. Outbuildings are grown last and are designed to fill the spaces between Anchor Lots and Machinery lots. Due to this lot's large size and the fact it is an Outbuilding, it can be hard to get it to grow through normal gameplay. Forcing an Industrial Zone to grow this size (By using CTRL while zoning) will greatly increase the chances of it growing. This page was last modified on 13 May 2014, at 12:43. This page has been accessed 3,254 times.